Defined for web pages, it is originally a standard format for any documents displayable locally by a web browser or a recent word processor. But it became language of user interface for web applications with the version 5, and so has replaced Flash. 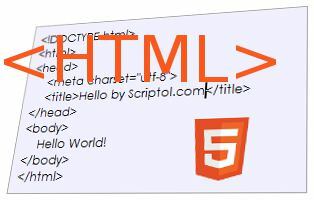 HTML, the HyperText Markup Language is a subset of SGML, (invented by IBM in 1969) defined by the W3C consortium. 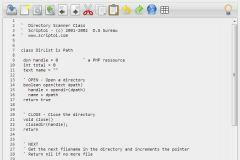 It is a document description language, that uses tags for properties. This is the format recognized by web browsers. The development has stagnated from version 4, the W3C polarizing on XHTML but could not reach a consensus on its definition. An independent initiative to a new standard , the WHATWG, re-launched it under the name of HTML 5, which led the W3C to rally to this new format and to make it the current standard. Originally, the language is not expandable as is XML. The developer can not add new tags and assign them a role that browsers can consider. But HTML 5 frameworks implement the Web Components standard to give this extensibility, they are mainly Polymer, X-Tags from Mozilla and Angular. These interface components working on the client side can eventually interact with the server, through Ajax, WebSocket, WebRTC. XML syntax whhose HTML derives is verbose, which is why it is often preferred JSON for data files to be processed by an application, but it has the advantage of readability. HTML is tag based, uses < > for delimiters. Unlike XML, tags are not necessarily closed. Unlike XML again, tags have a predefined meaning that is standard and recognized by user agents (mainly browsers). Unrecognized statements are ignored by the rendering engine (from the specification). Unlimited embedding of constructs. A limited number of tags are not containers. The specification of HTML and all standards of the Web is on W3C, the site of the consortium that defines the language. A validator is available to check the validity of your HTML code. HTML 5 Forms, show the code of all new form objects to check if they are implemented in the browser.